Sabratha – In the aftermath of weeks of conflict in the Libyan coastal city of Sabratah, IOM, the UN Migration Agency is providing support to more than 14,000 migrants, previously held in numerous informal detention centres and camps and now transferred to Zuwara and an assembly point in Sabratha. Since the outbreak of the crisis in recent weeks, 6,700 migrants have received core relief packages, which include mattresses, blankets, pillows and hygiene kits at six separate locations and more than 100,000 meals (including water and juice) have been provided in Zuwara and Sabratha. IOM has also responded to the vast health needs and conducted 1,631 medical interventions and treated 23 injury cases. In addition, 21 women have received pregnancy care including deliveries, while 476 migrants (250 men, 161 women and 65 children) have received psychosocial support. Out of 1,631 migrants interviewed so far, 44 per cent expressed a wish to return back to their countries of origin through IOM’s Voluntary Humanitarian Return Programme. Acknowledging the need for a quick response, IOM has provided online consular sessions for 332 migrants to speed up the travel document issuance procedures. Sabratha is approximately 80 kilometres west of Tripoli and is one of the main departure points for migrant boats attempting to make the perilous journey across the Mediterranean Sea to Europe. On 7 October, a day after the first transfer of migrants, IOM sent a field team to the assembly point in Sabratha to assess the situation. By the end of the day, the team reported that 2,600 migrants (1,819 men, 704 women and 77 children) were being kept at the site by the Libyan Directorate for Combatting Illegal Migration (DCIM). By 16 October, IOM emergency teams estimated that in total more than 14,000 migrants have been affected, with currently less than 1,000 migrants in Zuwara and around 500 migrants in Sabratha. However, as more migrants are transferred on a regular basis to the two sites, it is too early to confirm whether the wave of migrants is about to stop. Whilst the conditions at the two sites have been strained with primary needs including drinking water, tents, Water, Sanitation and Hygiene (WASH), medical and psychosocial support, parallel conditions in the detention centres have deteriorated as more migrants continue to arrive. 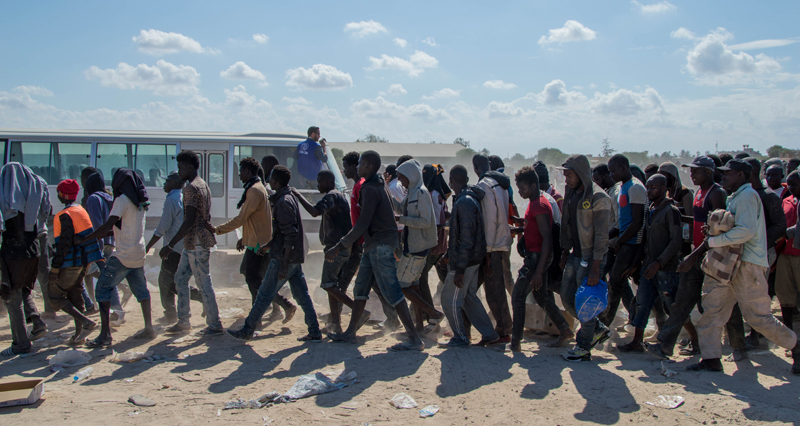 The migrants are primarily at five detention centres in Tripoli including in Ghariyan (some 90 kilometres south of Tripoli), which is primarily used as a transit point and currently houses 5,000 migrants. The migrants are from almost a dozen countries and among them are pregnant women, newborn babies and unaccompanied children.